Boyesen can handle a gift idea solution, no matter whether your recipient prefers two-strokes or four-strokes. Boyesen has you covered with gift ideas, whether you’re a two-stroke fanatic (with their Rad Valve) or four-stroke aficionado (via their Supercooler). The random drawing winner on this one will get their pick of either of these items. 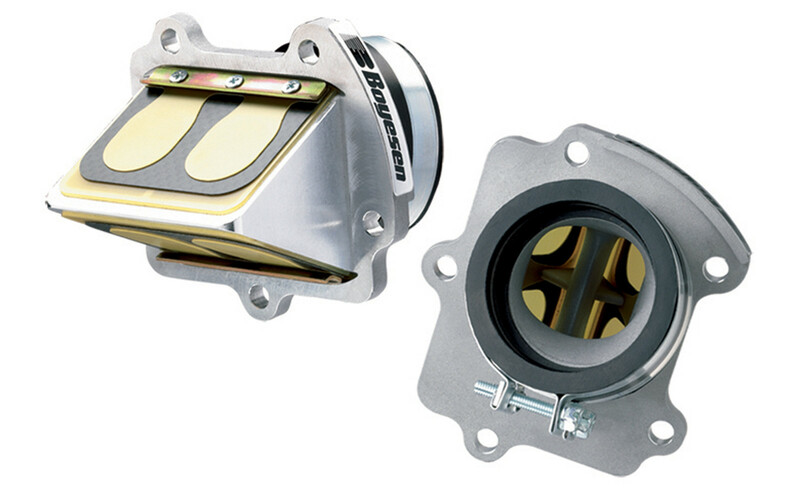 Boyesen’s RC2 Rad Valve ($179.95) represents the ongoing refinement of two-stroke intake technology. It’s been crafted with the goal of increasing torque and peak horsepower through design innovation: Aerodynamic Surface Optimization, Model-Specific Reed Petal Tensioning, Material Fuel Resistance, and Multi-Stage Reed Timing. Whoa. Together, Boyesen claims these innovations create a new technological benchmark in two-stroke MX and off-road intake performance. 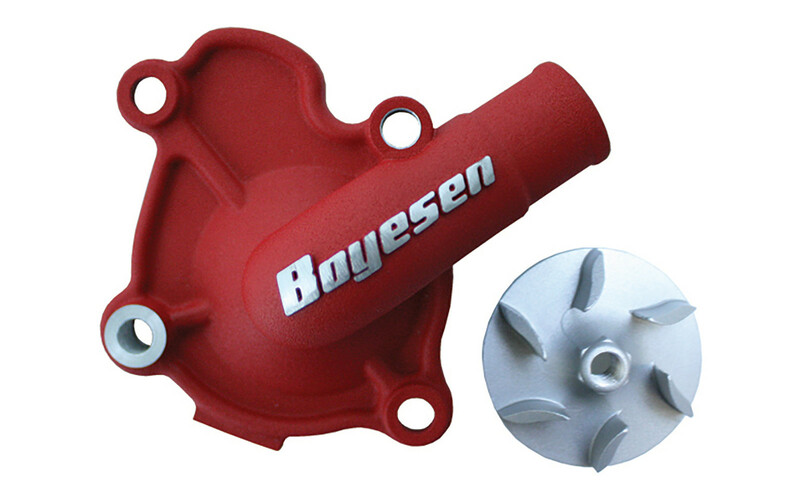 Boyesen SuperCooler Water Pump Cover and Impeller Kits ($189.95) are specifically designed to enhance the performance of your engine's cooling system. These high-flow, hydrodynamic water pump kits have been tested and designed to flow more coolant, and eliminate cavitation. By increasing the flow, the engine will run cooler at a more constant temperature. Click either of the links above for much more info and applications. such a rad, supercool gift! This would be great for my Husky! Awesome. Would love to put this on my Yamaha! Thanks for the chance! My KX 250 has a cold and this is just what the Doctor ordered. This would go great with the YZ 250 I just picked up! This supercooler would look supercool on my bike! I have a cr125 and a crf250r that could use these. Want one for my new 125 Im building ! I need one of thoes! My bike could use a Rad valve. Gosh Dag it! I am in! Gotta keep it running cool! Time to upgrade the 2 smoker! I've been eye balling a Rad Valve for my bike for a few months now. So much want. For sure need the supercooler! Awesome, could definitely use some Boyesen in my life!! I'm sure Dag B. would want me to win this one! Merry Christmas!!! The leader in performance products. Top shelf stuff. Reeds were a huge upgrade on the 150! I need new reeds too. I was about to get some Vforce but... if I win these... I won't need them! Never used one. Would try. Love the look of these water pumps! Project 04 could use that reed valve. I would love some of them sweet Boyesen goodies to add to my green beauty. Someone is going to score a nice setup,hope it's me. Boyesen is keeping things cool..
That Rad valve would be nice on my 250XC! Ouuch!! For KTM awesome !! Definitely could use the supercooler. Couldn't ask for a better present than this for my 05 KX125 build going on right now!! Definitely my favourite aftermarket company, as they are still dedicated to keep the smokers alive. Long live the 2strokes. Thank you for being a part of it Boyesen crew!!! I would love to have those! Pa based company right keep it local! Damn, that is a COOL prize. These parts are BOOOOOYESEN...BOYESEN BOYESEN - Sung to Bel-Biv Davoe's "Poison"
Boyesen has always made great products! Boyesen has always brought the key ingredient to refine the performance of motors for the consumer. Both of these are on my winter project bike list! I put a rad valve on my old kx250, and regained some top end that I lost when running a gnarly pipe. I preach the rad valve to all my two stroke riding buddies. Great product that really works! This could kick-off my 2 stroke rebuild. That super cooler would be super cool ? Great to see the rad valve still around after all these years! Great product! You could really make my YZ250 happy! Rad Valve would be perfect for my 125! I do have a Rad Valve on my KX250 (2stroke). I’ve tried them all, but do prefer the Rad Valve to the others. I have a CRF250 that could use a SuperCooler Kit, Santa! Could use the water pump and cover. Would look nice on my new bike!! Always up for boyesen goodies! Reed block would go nicely on the VMXDN Build! That would be the best gift under the tree!! Don't think they make supercooler for new Honda's. I've checked. Would look awesome on my crf! PIck a Guy with a last name of B. Get it? GuyB!! Come on, thats pretty good. Supercooler is super cool. Boyesen is good stuff! Love Boyesen!! Thank you for the opportunity VitalMX! Rad Valve for my YZ250, or water pump for my YZ450. Tough choice. The pump cover (and impeller) is a trick looking addition! Boyesen water pumps are thee best pump out there. Have a cr125 rebuild going on, the reed valve would be just sweet..
Man... I could really use this! My rm would love this stuff!! Itll make me go so fast! I would LOVE the opportunity to run that Super Cooler on the FE350! Would be sick on my 200SX KTM!!! Can't go wrong with some extra cooling power! Be great for the yz 125! Need this for my Yz. Thanks. A trusted name in performance products.